Can you believe it's the week before Christmas and I'm only just getting round to putting up some Christmas content! Our trip to Disneyland and work has really kind of screwed me over when it comes to blogging this December! It's been a couple of weeks since I've blogged, but that's ok because were back with even more content than I would normally post this week - yay! I wanted to do something fun and festive and though what better way to get in the Christmas spirit than do a Christmas Tag! I found this on makeupsavvy.co.uk and just thought it was so cute. I really hope you enjoy this tag and please do post your own answers, I've put all the questions down below for you to use beauties. This is so hard to choose I have so many! I think my earliest favourite Christmas movie is The Santa Clause, I've watched this every year for as long as I can remember, so for me this really is one of the most festive films. Of course I'm also obsessed with Elf, it's just hilarious. Simon and I watched this a couple of nights ago and I just couldn't stop laughing when Buddy eats the cotton ball - it gets me every time! Arthur Christmas is also up there, this is one of my newest favourites. Every year I also re watch all of the Harry Potter films. 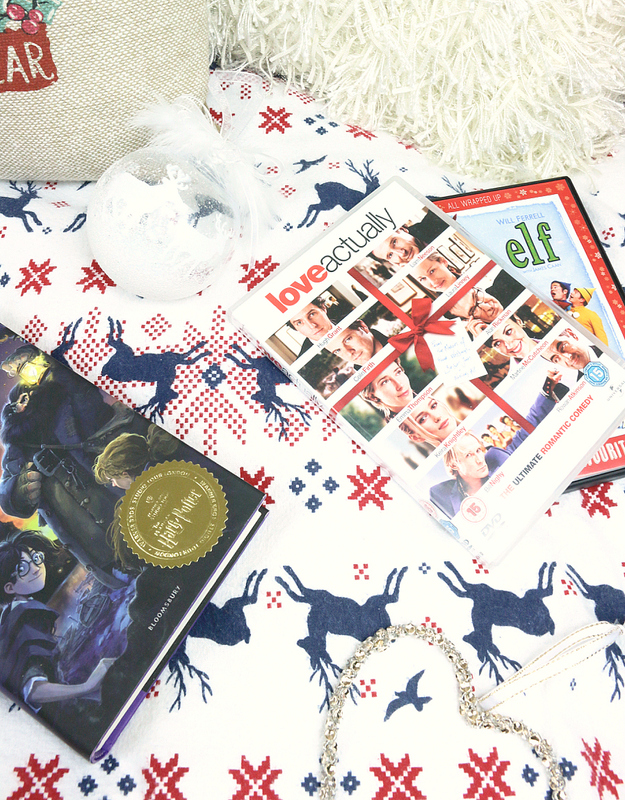 I know they're not exactly christmas films but for me they're so festive and magical! Finally I can't go a year without watching Bridget Jone's Diary, again not exactly a festive christmas film but it is slightly Christmassy. Also Simon and I have a little Christmas Eve tradition of watching Love Actually and ordering pizza, it's one of my most favourite things I look forward too. Christmas morning! Isn't that the main event of Christmas!? Every year I always beg Simon to let me open a present early and he doesn't let me. I actually think if he let me I wouldn't want to anyway, it spoils the magic of Christmas morning. I don't think I have one favourite. Whenever I think about past Christmases I just love the memory of having your family around you and everyone being in an amazing mood. I just love it when everyone's having th best time and laughing together and of course there's amazing food around! Christmas dinner! I can't choose. A roast dinner has always been my favourite meal so every year I'm very very excited for Christmas dinner. My Dad is the boss at Christmas dinner. Every little detail is just perfection. Last year was my first Christmas I didn't have my Dad's Christmas dinner and I had to make it myself and it just isn't the same when you're the one slaving away. Thankfully this year we're having dinner at my parents, so I get my Dad's Christmas dinner, yay!! I'm just not ready to let go of my family Christmas dinner and start doing it myself yet. Now that is very, very difficult! I'm so very lucky that every year Simon spoils me with amazing things. He gets me the cutest things that he knows I'll love. A couple things from last year that were amazing were some Ugg slippers. These were my main present from him and I love them so much, they're so cute and comfy - I'm all about being cosy! Also he bought me Destination Hogwarts the board game. I'm a massive Harry Potter fan and I love board games, so this is just the ultimate gift for me! This year I'm getting Harry Potter Cluedo, I literally can't contain my excitement! Anything spicy usually. This year I've been burning The White Company Winter candle and it's just so festive, it's packed full of Clove, Cinnamon and Clementine - you can't get more festive than that! Leaves from Bath And Body Works is also a firm favourite for me. Even though it's considered an Autumn scent, to me it just smells so spicy and Christmassy. I do also love a sweet/ fruity scent, so any kind of Christmas apple/cranberry scent usually floats my boat too. Yes! Every Christmas Eve, Simon and I order Prezzo pizza and snuggle up and watch Love Actually. Simple I know, but it's the thing I most look forward too. It means that it's officially Christmas and all the planning and organising has finished and now it's time to really just enjoy Christmas. Last year our tradition nearly got ruined. We ordered our Prezzo pizza for collection and went to collect and the restaraunt was closed! So that was the first time we didn't have Prezzo pizza, we had to make do with Dominos. This year I'm not sure what kind of pizza we'll have, maybe it's the end of the Prezzo tradition! This is the second Christmas Simon and I have been living together and both years we've used the same sparkly gold star. I'm not sure if it's going to end up being a tradition or maybe one year we'll change it. If we do end up using a different one, I definitely want to keep our first every tree topper. Honestly, I can't remember. I don't think I every really asked for anything that crazy. I always kind of new my parents limit and not to ask for anything extreme. Maybe in my head I would of liked a holiday or a puppy or something. The festive feels! Having time with your loved ones and everyone's just enjoying life and doing fun things together. Christmas is a time that should be magical, every part of christmas is just the ultimate best thing ever. The best people, the best food, the best films - it's all just so magical! I really hope you've enjoyed this fun little tag and it's got you feeling super festive. I'm bursting with excitement for Christmas eve! Please let me know if you decide to post The Christmas Tag beauties. Oh my goodness I just watched Elf for the first time the other day (apparently I live under a rock) and that part where he's eating the cotton balls was hilarious! Ahhh it's hilarious, I'm so glad you loved it!